How three experienced Herald Sun reporters used deception and trickery to distort the critical closure of remote Aboriginal communities issue into a propaganda piece about ‘commuter chaos’. Mark Pearce reports. 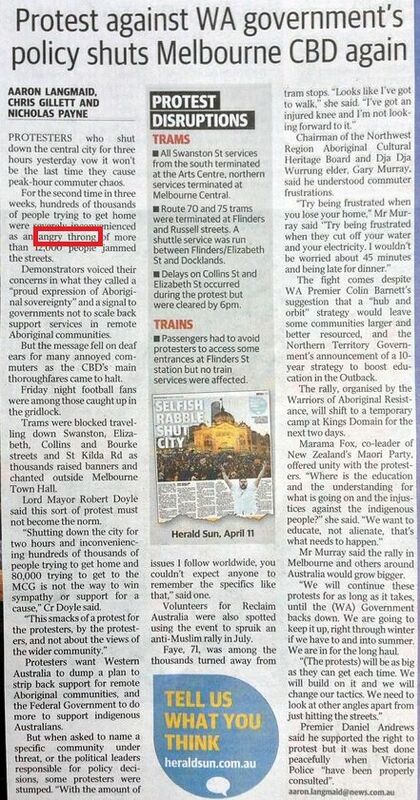 ON SATURDAY 2 May 2015, an insert article on page 5 appeared in a Herald Sun double page spread, connected with front-page headlines concerning a protest rally against the closures of remote Aboriginal communities that shutdown Melbourne’s CBD. In the age of media restructures and budget cuts, apparently it takes not one, not two, but three journalists to undertake the reporting and writing of a two-hour event. 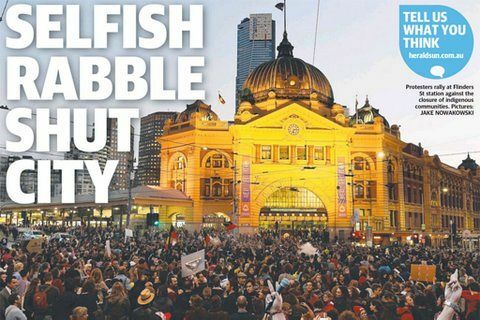 Throughout the insert article 'Protest against WA government’s policy shuts Melbourne CBD again', we witness a plethora of heavy-handed right wing language, unofficial reporting, no fact checking and omitted information. You might imagine that three qualified journalists writing a lead news story for Melbourne’s primary newspaper could have the capacity to pull together all their skills and write an in-depth discussion (with an educational or informative approach) depicting the real Australian Indigenous issues of today. None of this seemed to occur. To begin, lets examine part of the headline phrase: “WA Government Policy”. The WA government has not released anything in the form of an official written policy vis à vis the closure of remote Aboriginal communities. They obviously have some sort of a plan – perhaps an unplanned plan – but no official policy. 'An angry throng of ... people'? Really? 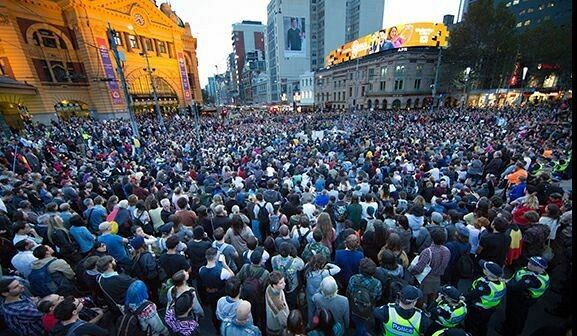 This event was a peaceful march and rally attended by young and old Australians; families with children, mothers, fathers, uncles and aunties, sisters and brothers of all colour and race. If this was an 'angry throng of 12,000 people' as suggested, where are the arrests or violent outbreaks? After all, if 12,000 people were angry, surely at some point hostility provoked somebody? But there was none of that. No arrests, just a peaceful protest. The photograph from the same article speaks a thousand words; a peaceful "sit-down" listening to leaders who voiced their concerns about governance and humanity — an act also known as "democratic free speech". So was this a throng of 12,000 angry people, or 12,000 people just following their spirit? When asked to name a specific community under threat, or the political leaders responsible for policy decisions, some protesters were stumped. “With the amount of issues I follow worldwide, you couldn’t expect anyone to remember the specifics like that”, said one. Assuming the journalists attended the event and spoke with some of the 12,000 protesters, surely at least one human being would have obliged them with their name? If the journalists had researched this issue, they would recognise the fact that there has never been and never will be any naming of any community “to be closed” or “not viable” as WA Premier Colin Barnett has not declared which ones are in the firing line, just that up to 150 outstations may be closed. Everything else is silence. This act of government silence is the incident that has incited 98 organised protests held around the world on 1 May 2015. Where is Faye walking to, or from for that matter? If anyone has ever visited a CBD, at some point you know you need to get out of a car, or tram, or train, or office, or shop and walk to your destination. Perhaps Faye just forgot to bring along her magic carpet? 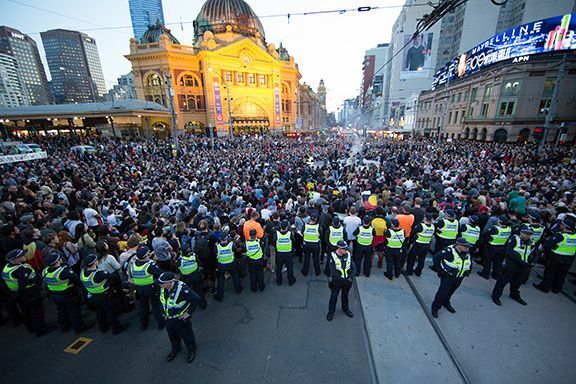 Apart from the all day “rolling live coverage” reported from the Herald Sun website to bring citizen awareness of the event, Victorian Police officers safely guided the march of 12,000 protestors, including dozens of police waiting in place at the city square destination. What on earth wasn't “properly consulted” with police? If we want to talk about proper consultation, perhaps Mr Andrews’ Victorian State political counterparts might think about having detailed discussions with Aboriginal leaders and the people who live in the WA remote communities, rather than deflecting "consultation problems" back at the (Warriors of the Aboriginal Resistance) organisers, who staged a successful and peaceful event. 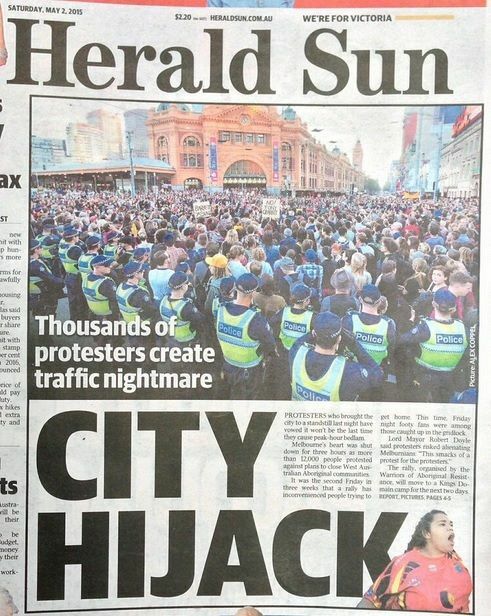 Yes, shutting down the CBD was part of attaining mainstream awareness of the issue, however the dysfunctional disinformation, including the inflated figures of football fans affected and the front-page headline “City Highjack”, is the same perpetual propaganda machine still squeaking. Governments and media organisations don’t grind this primary school disinformation out to people who are already on board with what they’re saying but, rather, to the people who need to swallow the pill a little more slowly. For the last 200-plus years, the machine has been tinkered with, but the same sounds of “the savages”, “the uncivilized” “the uneducated”, “the morally deficient”, and “the second-class citizens” still exists. Their culture is “primitive”, they’re “not progressive” and, today, they’re living an “unviable” or “unsustainable lifestyle” we hear — in one of the richest countries on the planet. Accordingly, we see the same rattling of the machine in this double page spread headline 'Still Selfish, Still A Rabble'. 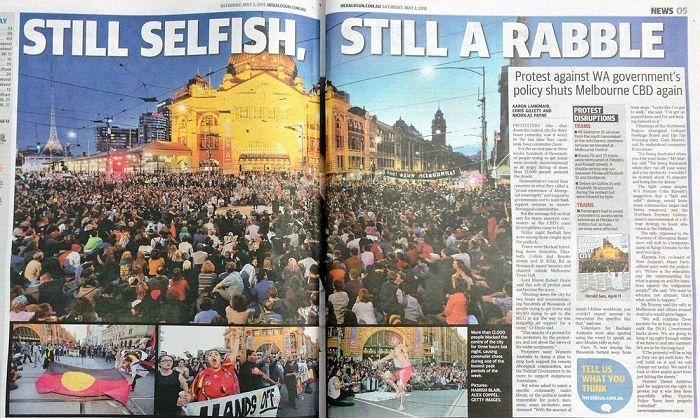 Which was an unapologetic follow up from their April front page about another Indigenous rally, which declared peaceful demonstrators to be: 'Selfish Rabble' (see below). This dehumanization has always been the argument; therefore you can’t negotiate with them. There are members in all factions of society that can’t be reasoned with, but the fear-mongering component is effective with Aboriginals living in remote communities because it plays on the “othering”. If you never see, or hear from another group of people it’s very easy to demonize them. History shows us how the British negotiated with the First Australians previously. Is there any negotiating with Aboriginal communities today? Has anything fundamentally changed? The fact is, very little has changed, except the actual policies, which eventually remove Traditional Custodians from their land anyway. The policies and their proceedings have resulted in the gradual disintegration of cultural standards, including fringe communities in urban areas, rising rates of alcoholism, incarceration and youth suicides, and ultimately the disempowerment of the people. 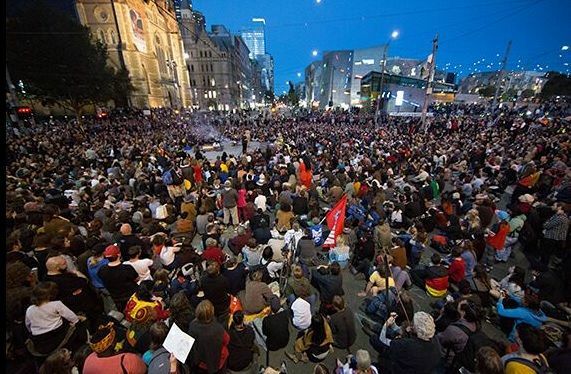 It’s clear that government and sections of their sidekick media corporations want to fashion the Aboriginal issue around personalized emotive issues like we can’t “subsidise lifestyle choices”, which equates to “draining the tax-paying purse”, and then allow other nonsensical matters to take flight such as focusing on “commuter chaos”, caused by "angry throngs" of protesters affecting the elderly and city workers who may end up getting home a little late for dinner. The irony of the issue couldn’t be stronger. It’s another chapter in perception deception, which over time ultimately allows government to drop the palatable pill so that it digests into dozens of petite ills and evils, eventually seeping into mainstream consciousness. Amnesty International and United Nations back the fight against remote Aboriginal community closures. The three journalists and their editors seem to have omitted this all-important fact. Perhaps they too have contracted "Murdochian amnesia" when it comes to the issue of human rights. Mark Pearce is a Melbourne based filmmaker who has produced and directed a range of micro documentaries on Aboriginal and environmental issues that people of the Kimberley face. You can follow Mark on Twitter @balangara.